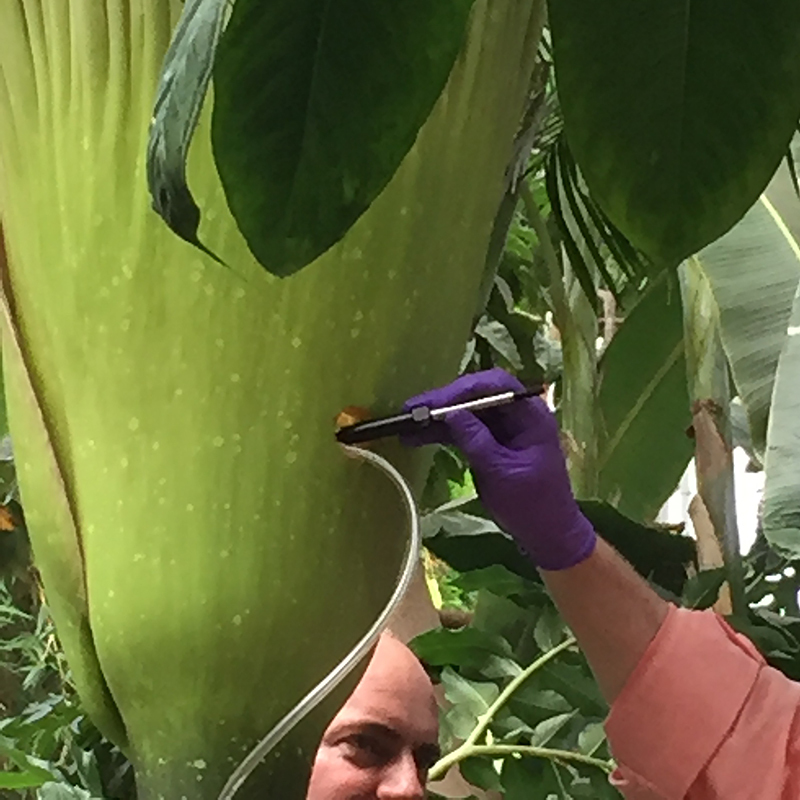 In all my years going to the US Botanic Garden, I never was able to catch the blooming of the infamous corpse flower. This rare event (once every few years) is always greeted with much media attention, so large crowds inevitably line up to get a glimpse of the massive inflorescence and to get a whiff of its distinctive odor. Perhaps it is the garden snob in me but I tend to roll my eyes at the sudden (and short-lived) public interest that swells up when these megaflora unfurl, making it so that I have to wait in line to get into somewhere I go all the time. To be honest, I have kept my distance from the whole spectacle in the past. Finally a friend from the suburbs demanded that we join the crowds to see (and smell) the flower, and the day we planned just happened to fall on the day the flower was expected to complete its grand transformation. We arrived midday on a weekday and there was a line wrapped halfway around the distinctive greenhouse structure. There was a distinctive buzz of excitement among the tourists, garden experts, and Washingtonians on their lunch breaks. The bloom of this flower only lasts 48 hours at the most and there hasn't been a flowering in DC since 2013 so the buildup and the hype are justified. As the line moved fairly quickly I found myself getting swept up in the giddy mood of the crowd and by the time the friendly volunteer threw open the door into the Garden Court, my pretentious attitude melted away. I couldn't wait! 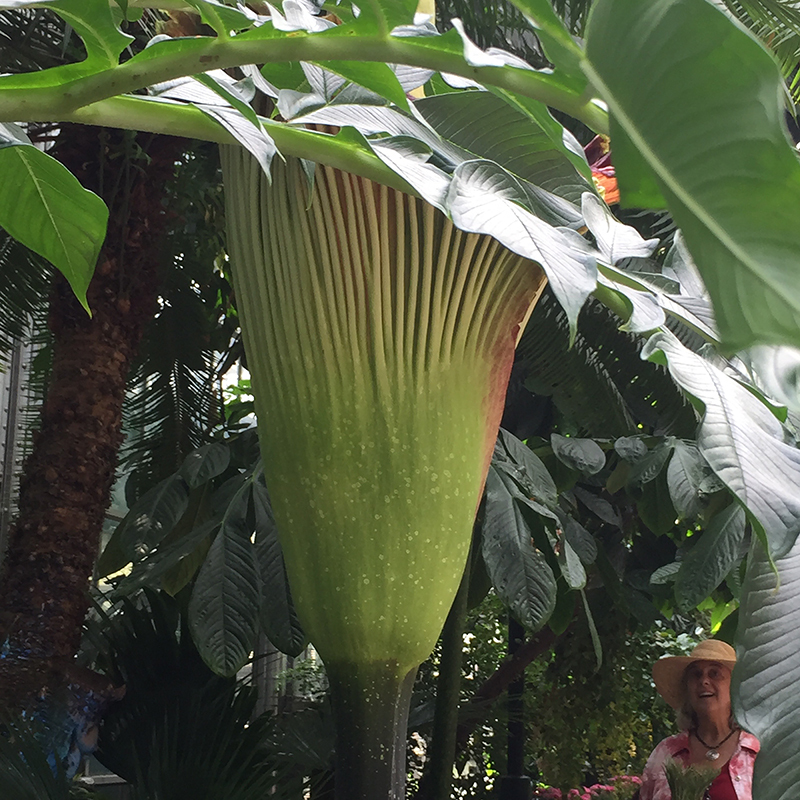 I wasn't prepared for the size of the "the largest unbranched inflorescence in the world": it took my breath away, towering above the throngs of admirers with a indifferent, regal glory. From within the vaguely reptilian, purple-tinged, ribbed ruffles of the spathe the spadex rose mightily like a massive floral spaceship about to blast through the glass ceiling of the greenhouse. The whole ostentatious display was set atop a mighty, stubby stem rising like a submarine telescope from its large pot. One can only imagine coming upon such a flower in the wild (it only grows in select areas in the rainforests of Sumatra, Indonesia). It was truly humbling to stand in the presence of this mighty flower, so perfectly constructed for its own purpose and oblivious of the world around it. So now I am one of the converted and if you hear about a blooming titan arum in your city, I strongly urge you to run -- do not walk! -- to your nearest botanic garden. The long lines and entrance fees are really worth it, especially if you can make it for the brief peak blooming. I have never seen anything like it before and it has taken my appreciation of flowers and nature to a new level. 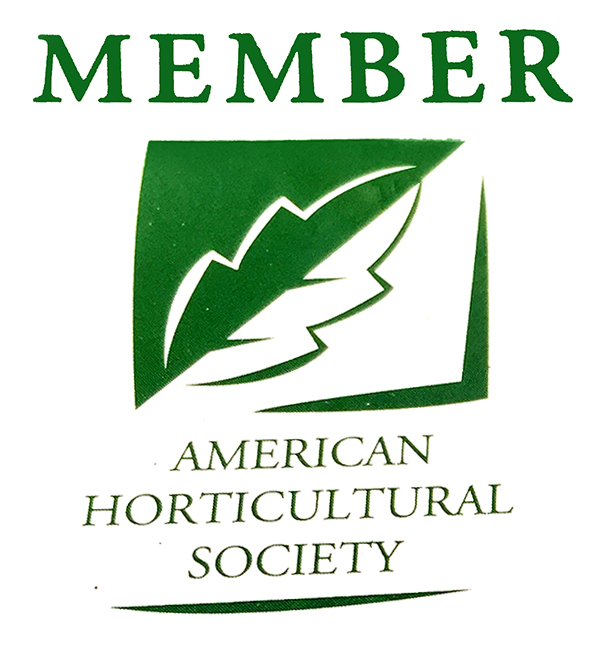 >> Visit The U.S. Botanic Garden!